Small molecule drugs obtained from synthetic compounds or natural products show their therapeutic effects by specifically binding to one or a few target proteins and modulating their functions. In contrast, undesirable drug-protein interactions may provoke harmful side effects. Furthermore, drug-protein interactions also play roles in drug activation, transport, metabolism and regulation of drug resistance. Therefore, systematically identifying binding proteins of a drug molecule is critical for understanding the mechanism of action of the drug at molecular level. 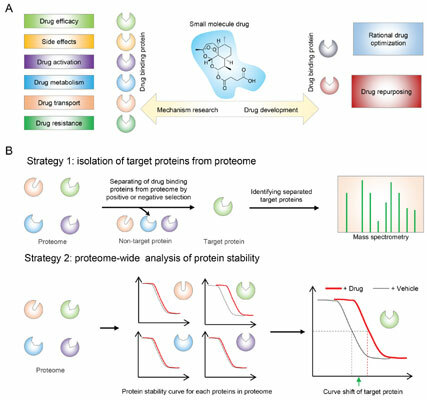 In this review, we summarize current widely-used experimental approaches for proteome-wide target identification of small molecule drugs, including affinity purification, chemical proteomics and protein thermal stability based methods. The advance of these methods will quicken the pace of target deconvolution of small molecule drugs and hold promise for drug repositioning research. Moreover, these approaches also provide a powerful arsenal for exploring the signaling pathways of small molecule second messengers, signaling lipids and other regulatory metabolites. Target identification, target deconvolution, drug-binding proteins, affinity purification, chemical proteomics, protein thermal stability, drug repositioning.